Accent marks (sometimes referred to simply as accents) and accented characters are important elements in both written and spoken language, and, by extension, in typography. While their use in English is largely confined to proper names or “borrowed” words of foreign origin, such as résumé and tête-à-tête, they occur frequently in several other European languages, including Spanish, French, Italian, German and Portuguese. 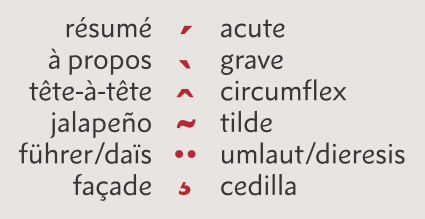 The most common accents are the acute (é), grave (è), circumflex (â, î or ô), tilde (ñ), umlaut and dieresis (ü or ï – the same symbol is used for two different purposes), and cedilla (ç). Accent marks (also referred to as diacritics or diacriticals) usually appear above a character. One exception is the cedilla, which appears directly underneath the letter c; several less common accent marks appear next to the character. Several “borrowed” foreign words containing accents are shown above. In some instances, the accent is optional in English once the word has become part of common usage. These small yet significant symbols indicate pronunciation, including emphasis. In some instances, the accent mark also clarifies the meaning of a word, which might be different without the accent. With names and other proper nouns, neglecting to include the correct accent marks can be seen as a sign of disrespect. These two words – one with and one without the accent – have different, yet related meanings. The first describes an action, and the second, a divorced man. A divorced woman is a divorcée. Most professional-quality fonts include both a range of individual, floating accents and composite or prebuilt accented characters. Floating accents are used to create accented characters on-the-fly, while the prebuilt version is used as-is. Basic OpenType® fonts as well older Type1 and TrueType fonts have a standard set of the most commonly used accents and accented characters. OpenType Pro fonts have expanded foreign language support, and offer a much more extensive selection of accents and accented characters. This is the standard set of accents and accented characters found in basic OpenType fonts, as well older Type1 and TrueType fonts. Prebuilt accented characters can be accessed either directly from the glyph panel or by using specific key combinations; many more can be created on-the-fly by using key commands to add the floating accent to create the desired character. Note that keyboard commands vary between Mac and other PC software, as well as for non-U.S. keyboard layouts. 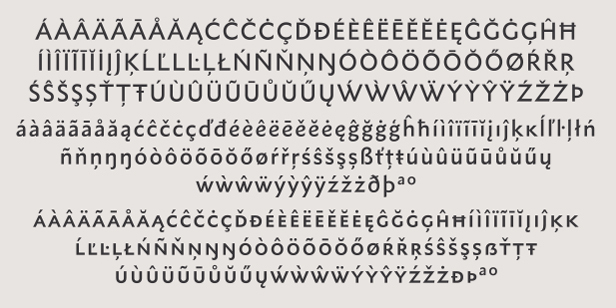 OpenType Pro fonts contain a much larger set of accented characters, as shown in this setting of the Metro® Nova typeface. 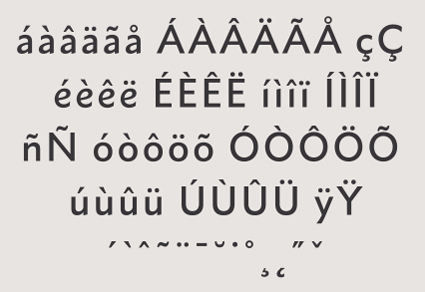 When setting type that requires accented characters, take the time to locate these somewhat uncommon glyphs. Be sure to select or create the correct one, as some can be easily confused, such as the acute and the grave accent. Proper, consistent inclusion of accent marks and accented characters is an essential element of professional typography, as well as an opportunity to satisfy clients and help inform readers. All trademarks are the property of their respective owners. Additional information regarding Monotype’s trademarks is available at monotype.com/legal. Fontology is a trademark of Monotype Imaging and may be registered in certain jurisdictions.